Every year around this time, excitement starts building in the desert. The daytime highs are well into the 100s; sometimes 110 or more. Seasoned desert-dwellers start scanning the skies for something other than the deep blue we have almost all year; we’re looking for the clouds that signal the monsoon rains are on their way. 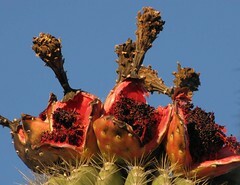 The desert is alive, in spite of what some people think. 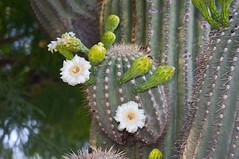 In late April and early May, the stately saguaro cactus flowers. The creamy blooms don’t last long but are followed by the bright red fruit. As the temperatures climb, we know the rains are on their way to cool the parched desert.We scan the skies daily hoping for clouds; we watch as the dewpoint creeps up towards the magic number of 54. But there will be days when the clouds look promising, and nothing happens. It’s the big tease before the monsoon finally brings rain. Sometimes, the air is so dry that it rains, but the rain never hits the ground; a phenomenon called virga. And then the rain comes; pouring, pounding, hitting the ground so hard the raindrops bounce off the hard, dry ground; streets become rivers. There is lightning, thunder, wind that bends trees to the ground. And then, quiet, as the storm rumbles off into the distance. The cool, damp air feels wonderful to people so long deprived of moisture. Steam rises as the sun comes out to once more heat up the air. And then we wait for more.